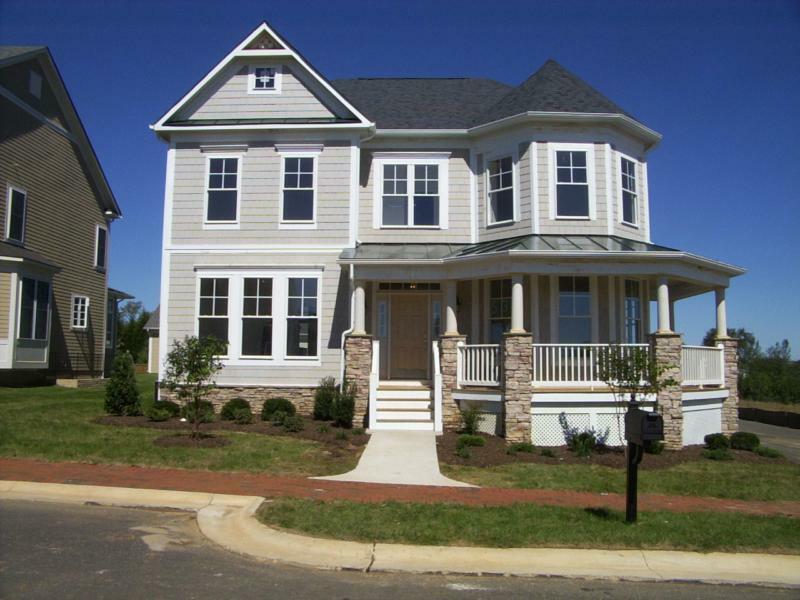 Village Case is a new community under construction in Purcellville, Virginia. The design of the community is set to feel like a traditional neighborhood: brick sidewalks, wide front porches, homes at the front of the lot. Homes set close enough together that you really have a sense of neighborhood. Detached two car garages sit behind the homes and are accessed by alleys. We were one of the first owners to move in over three years ago, and we love the close relationship we have with our neighbors, as well as being within walking distance of shopping and schools. The town of Purcellville has been very careful in its comprehensive planning to grow slowly and retain the small town feel. There are several builders in the community, Michael Harris Homes constructed our house, pictured above. Other builders include RT Homes, Inc. and Patowmack Associates, whose designs are similar in style. For more information on the town of Purcellville, visit www.purcellvilleva.com . For more information on Patowmack Associates, visit www.patowmackhomes.com . For more information on Michael Harris Homes, visit www.michaelharrishomes.com .